...and G*d said "let there be snow"!!! An all night dumpage layed about 8 to 10" inches on Ajax. Today was one of those days that the touristas and the fractional types---just don't get to see. NSNP---New Snow, No People. After 2 weeks of "The Firm"---we needed POW. What was especially nice about today's dropping was the dry, fluffy nature of the flakes. SWEEEEEeeeeeeeet!!! The huge bumps became stompable. 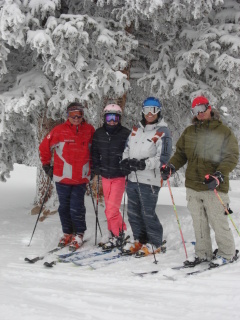 Here at Aspen Spin we don't just report about the snow, or read about it on other web sites-----we ski it. Today we skied it hard. Valentine's day 2007, found it's way into the A-SPIN top 10 days of the season----so far. It wasn't the absolute best, but maybe 5th or 6th. Lets hope it gets knocked out of the top 10 soon------starting tomorrow. Hiding out in the new ASPEN SPIN SHRINE (l to r) are Lenny Allen, a major force in Aspen R.E. Mary and Adam Cherry who crib in Del Mar & Aspen and local legend, Jonathan Feinberg You'll need more than a trail map to find the A-Spin Shrine, you'll need to hire a "Redcoat" to take you there. As always, in Aspen, -----you gotta pay to play. 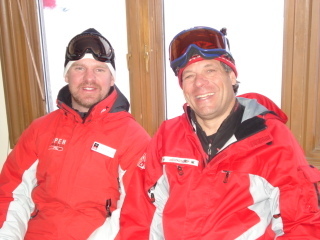 Shown below is extreme ski pro Pat Vaughn along side Lenny Allen gettin' ready to enter The White Room.